Main Street Gazette: "Ready when you are, W.D." Whenever we saw Walt appear on television, some of us through archival footage years after he had passed away (due solely to the fact that we were born too many years too late), he always appeared comfortable, contented, and magnanimous. That, as it turns out, may not have always been the case when it came to appearing on screen. In the Fall 1993 issue of Disney News, Michael Mallory spoke to Paul Carlson about his experiences with Walt Disney the host, both on and off camera. 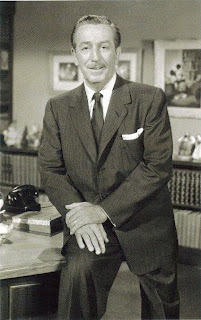 When Walt Disney was first planning to take on the new medium of television with a new show called “Disneyland,” many at the Studio felt he would make the perfect on-camera host. All they had to do was convince Walt himself. Eventually Disney was persuaded and the rest is history. Since Nichols and Carlson worked in live-action as well as animation, the job of directing the boss in his filmed lead-ins fell to them. Yet nothing escaped Disney’ perfectionist eye, not even himself. Those who had pegged him as the perfect host were right: in 1955 Walt received a personal Emmy nomination for Most Outstanding New TV Personality. Off the set Carlson and Nichols met with Disney once a month to discuss the unit’s various projects, which included “Fresh-Up Freddie” commercials for 7-Up and “Bucky Beaver” spots for Ipana Toothpaste. Carlson also illustrated a series of “How To Draw…” character books, a job for which Walt “cast” him, he says because of his neat lettering.